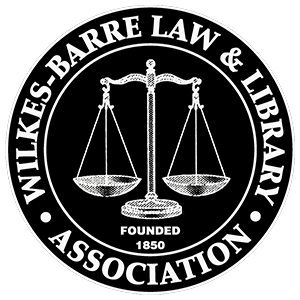 The Wilkes-Barre Law and Library Association founded and incorporated the Luzerne County Bar Association Charitable Foundation, Inc. in October 2003 with the intent to promote the Wilkes-Barre Law and Library Association and the image of the Luzerne County Lawyers. The Luzerne County Bar Association Charitable Foundation will support charitable and humanitarian projects throughout Luzerne County, Pennsylvania to provide support for law related projects, publications and education. The Foundation will enhance the public’s understanding and appreciation of the legal system in Luzerne County, ensure access to legal information and representation to all members of the Luzerne County community and foster good relations between members of the Bar, Judiciary and the public. The Foundation vows to do this among its other activities in furtherance of its charitable mission. Your donation can be made in honor of a loved one who has passed, someone who has reached a milestone in life, a wedding, graduation, a new practice, or you may make a donation to the Foundation as part of an estate plan. With your kind and generous contributions, the Luzerne County Bar Association will make a donation to a non-profit organization annually. With this, the association hopes to better the community as well as enhance the image of the Luzerne County Lawyers. All donations will be acknowledged to the donor and to the donee or donee’s family. The amount of the donation will not be listed. Also, the donor will receive a tax deductible statement for his or her Income Tax Return, as donations to the Foundation are generally tax deductible. Children’s Service Center of Wyoming Valley, Inc.